I’m sitting on an airplane right now. Over the next hour or so, I’m going to write this blog post. I really want to write a blog that you will find interesting and useful. If I don’t? I might feel bad. My blogging privileges may get revoked. I might even get fired. But even if this is the worst blog ever written, no one will die because of it. I wake up and try to do a great job every day, but frankly, the stakes are low. The men and women who build, fly, maintain, and coordinate the flight patterns of the plane I’m on right now are in a different boat. I - and the 150 other folks on this aircraft - have trusted them with our lives. According to the National Air Traffic Controller’s Association, on any given day, more than 87,000 flights are in the skies in the United States. Only one-third are commercial carriers, like American, United or Southwest. On an average day, air traffic controllers handle 28,537 commercial flights (major and regional airlines), 27,178 general aviation flights (private planes), 24,548 air taxi flights (planes for hire), 5,260 military flights and 2,148 air cargo flights (Federal Express, UPS, etc.). 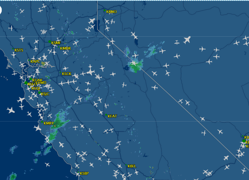 At any given moment, roughly 5,000 planes are in the skies above the United States. In one year, controllers handle an average of 64 million takeoffs and landings. That’s a lot of opportunity for error. It's tragic when an airplane crashes, but thankfully it’s also rare. Intuitively, driving an automobile with its wheels on the ground at 75 miles an hour seems far less dangerous than flying a loaded aircraft that weighs about 187,700 pounds at 510 miles per hour and 31,000 feet, but it isn’t. The National Safety Council compiled an odds-of-dying table that calculated the odds of dying in a motor vehicle accident to be 1 in 98 for a lifetime. For air and space transport (including air taxis and private flights), the odds were 1 in 7,178 for a lifetime. So despite the inherent risks, flying is a remarkably safe way to travel. Why? They simply do not ignore any failure, no matter how small because standards must be consistently achieved or something horrible may happen. They address every process failure immediately and completely. Complex processes can easily spiral out of control. Airlines and other high reliability organizations know that they are complex, so they don’t accept simple explanations for problems. They understand how to dig for the root cause. Executives make business decisions, but the people who have the most current access to information about the real-time situation on the ground and in the air are the ones who will make the hundreds of little choices that will get me home safely. When something unexpected occurs airlines have a system for reacting and finding solutions in a dynamic situation. Airlines are not alone in the role of doing something that might result in catastrophic failure. Hospitals, NASA, power plants the military and others pull off amazing successes every single day. There’s a good chance that no lives are on the line if your business processes are flawed, but what if there were? It’s quite possible that applying some of the attributes of a HRO to your business might be of benefit.